I’m so excited to begin a new year meeting new friends! Today I kick off a new year of Getting to Know You with a writer I’ve been following for quite some time. Nancy writes at Writer Granny’s World and let me tell you, it’s full to over flowing with great tips and encouragement for all of us writers! Nancy posts every day Monday through Friday. She sometimes features guest bloggers, writes reviews, and gives marketing help. Her writing consists mostly of creative nonfiction and she loves helping other writers. She’s been published in 17 Chicken Soup for the Soul books, children’s magazines and is an e zine contest winner. Nancy believes it is NEVER too late to start your own writing journey!! That’s encouraging to me as I look forward to a new year and new writing challenges for myself! I just know you’re going to enjoy Nancy’s writing as much as I do. I love new beginnings! Opening a book to the first page gives me joy. Putting on a piece of clothing for the first time is pure pleasure. Visiting a place I’ve never been before excites me. The first day of a new year does much the same. If you’re a person who keeps a journal, you’ll open to page 1 today and, with pen poised, consider what you will write. A journal keeper should do a lot of free-writing. Let the words flow from your mind to the page without thinking or organizing. Let them come like drops of rain, one right after the other. You may be surprised at what appears on each page and perhaps inspired. Today, consider the photo above. To the left are golden Christmas ornaments which reperesents the past year. Christmas was the great crescendo to 2015. Those ornaments stand for all you did in your writing world those past 365 days. You’ve most likely reflected on your accomplishments and your failures–oh yes, we all have plenty of failures along our wriitng path. You know what worked last year and what didn’t. 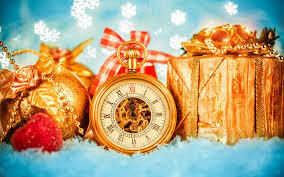 In the middle, we see a lovely gold pocketwatch of old which represents Time. Writers battle with time on a daily basis. How much of it do we devote to our writing and how much to the rest of our lives? Much depends on whether you write for a living or are a part-time or hobbyist writer. If we’re not vigilant, Time can get away from us. That pretty little pocketwatch can start rolling downhill and gaining speed, leaving us far behind. Grab on and hold tight. Be the master of your time and you’ll most likely have a more productive year. On the right side of the photo, we see a beautiful gold-wrapped gift box. That box reperesents all that is given to you this next year in your writing world. You’re given the gift of friends who also write. They cheer you when you succeed and soothe your feathers when you don’t. They understand what non-writers do not. You’re given an easier method of finding markets than ever before. No more poring over market guides at a library table or having to purchase your own guide that is outdated as soon as it comes off the presses. Technology gives you up-to-date and easy-to-find markets. You’re given a new beginning, given a time to set some goals, given a whole new year in which to ply your craft in the very best way you can. Open the box and savor the contents, then begin using the gifts inside. Did you notice that each of the three items in the photo are golden? Gold has been man’s treasure for centuries. Why shouldn’t it represent what we value most in our writing world? It’s the best! And so are you, the writer. Wishing you the golden touch in your writing in this next 366 days (yep, it’s Leap Year!). Nancy has been a great aid and inspiration to me. She is an accomplished, prolific writer and I applaud her! Thanks Bobby for the very nice compliment! Couldn’t have said it better! Nancy truly is an inspiration!! Thank you, Robyn, for featuring me and my blog here. Loved reading the comments. I hope your readers will visit me and maybe even sign on to be a Follower if they like what they see. Master of time indeed. That’s the biggie, isn’t it! Consistency seems to be key. It’s so easy to jump off the writing train when other tasks call. Here’s to a productive 2016 for all keen writers! That is so true Sarah! I can get off track with my writing at any given moment! Be the master of your time and you’ll most likely have a more productive year. Here’s to a great year of writing! Thanks Joan! Her writing always make me stop and think and usually leads me down a path of creativity! Her master of time line really hits home! This is quite interesting. Inspiring. Glad you liked it Paola! I’ve just been over to take a look at Nancy’s blog. It looks really useful. Thanks for Sharing. You’re welcome Wendy! Yes, her blog is fantastic! Oh thank you Verushka and you’re so welcome. I love sharing all of these fantastic writers! You’re all amazing! Roybn, Thank you for sharing, you bring the best out of others. Wow this is a magnificent read! I am glad you shared this with us because it is written beautifully and elegant! I agree on all counts Anna!